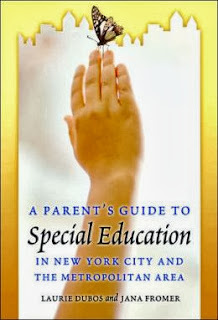 If you live you in New York City and have a child with special needs A Parents Guide to Special Education in New York City and the Metropolitan Area by Laurie Dubos and Jana Fromer will be your bible. Especially if you are going through the Turning 5 process. I purchased this book more than three years ago and it's one I still go back to again and again. And it's one that I always recommend to parents. So what's so great about this book? Well...it's broken up into 4 parts. Pay attention, these parts are important. 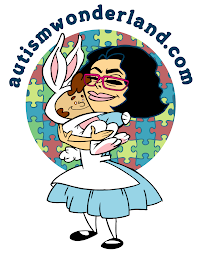 Part I provides an overview of special education in New York City. Talks about the children entering kindergarten and how they may be identified. It goes through the evaluation and referral process and the types of evaluations that are needed when applying to private schools. It also explains the difference between a Psychoeducational and a Neuropsychological. It breaks down the IEP and explains parents rights. Part II talks all about private school placement and the application process. Part III is all about the schools. It provides all the key factors of the school - whether it's graded or ungraded, if it's 10 or 12 months, what kind of classifications they accept, what related services they offer and other critical information. If you don't know how to find a school - this is a great place to begin. Part IV provides local resources: evaluation centers, therapists, medical professionals, websites and more. A Parent's Guide to Special Education in New York City is a must have for parents and even for special education administrators and teachers. For more on the Turning 5 Process check out my new weekly series Turning 5 Tuesdays #T5Tue click HERE.